History was made in Capilano University’s Sportsplex on Friday, Jan. 12. The men’s basketball team was playing the Vancouver Island University (VIU) Mariners, however, the evening won’t be remembered for the game. On that fateful night, two lives were forever altered in the most memorable way possible. Although Blues men’s basketball head coach Cassidy Kannemeyer is used to designing and calling plays for his players, that night, he had one planned for himself. Before the men’s game even began, perhaps the biggest play call of his career was underway – for the first time ever as a coach, he was the one taking the shot. The game opened with the national anthem as always. However, when the team’s starting lineups would usually be announced something planned but unexpected took place. “Now ladies and gentlemen, before we begin I’d like to announce Capilano University athletics director, Milt Williams, for a special presentation for the Vancouver-Mount Pleasant, MLA, Melanie Mark,” the game’s announcer said. Williams, proceeded onto the court with a microphone in hand. “Good Evening,” he said. “It gives me great pleasure, to introduce and acknowledge the honorable Melanie Mark, the Vancouver MLA for Mount Pleasant. “Melanie, if you could come up please,” he continued, motioning towards Mark, who was in the Sportsplex’s bleachers, to come forward. Although she seemed surprised by the announcement, she handled with poise – as a well practiced politician would. Mark left her daughters Maya and Makayla and calmly walked across the gym’s floor from the stands, to Williams. “Melanie was appointed the Minister of Advanced Education, Skills and Training, and she is the first female First Nations Cabinet Minister to sit in the BC Legislative Assembly. Congratulations Melanie,” Williams continued as Mark looked around in surprise and excitement. Meanwhile, Chris Raeside, the Blues’ athletic events and sport development officer, carried a bag from behind the scorers’ table to Williams. “Melanie, please accept this gift from Capilano University and Blues Athletics, congratulations,” Williams said, handing Mark the bag. Williams then asked Mark to wait a moment before returning to her seat, motioning towards the Blues’ Bench. “Coach Cassidy Kannemeyer, men’s basketball,” he said inviting the coach to the floor. “I know the coach is my boyfriend, I don’t think anyone else does,” Mark later recalled. Kannemeyer then left his bench, and walked toward Williams and Mark, with Williams handing him the mic. Then, as he reached into his jacket pocket and pulled something out, he got down on one knee and proposed. Mark then threw the bag from Williams over her head and dropped to her knees. “I’m putting a lot of pressure on you right now,” the coach said as Mark rose back to her feet. “Will you marry me, Melanie Mark?” he asked as Mark made the shape of a heart towards him with her hands. “I have the love of my life proposing to me,” she can recall thinking. “Yes,” she said, dropping back to the floor, grabbing Kannemeyer and kissing her fiancé. Just as they embraced, music played over the speakers. “Don’t stop, Believing,” echoed throughout the gym. Journey’s 1981 classic is Mark’s favorite song. When Kannemeyer, Williams and Raeside had planned the evening’s script, Kanneyemer made sure Raeside knew not just what song to play, but also the exact point to play it. “Chris came up with a great idea and said, ‘well what song does she like?’,” Williams recalled Raeside asking. The entire presentation was actually planned as a way to allow Kannemeyer to surprise Mark with his proposal. “I knew that I really wanted to do something extravagant like that because I love the public sphere to make the gesture of having that moment that we’ll always remember and the excitement of that moment,” Kannemeyer explained. Kannemeyer and Mark first met in 2015, when Mark was campaigning at the Hastings Racetrack where Kannemeyer and a group of his friends happened to be. The two hit it off immediately, bonding over more than a few common interests. Both grew up in East Vancouver and are still strongly involved in the community in many ways. They’re both ex-athletes who appreciate the teamwork and values sport instills and above all, love children, Kannemeyer explained. “Those things helped foster conversations, but I would say that we were definitely attracted to each other the first time we met,” he said. Flash forward to 2018, Kannemeyer and Mark were ready to get married and planned a ceremony for Jan.18, 2018 – a date they believed to be symbolic due to eight being a lucky number and the infinity sign. But, neither one ever officially proposed to the other. So, Kannemeyer approached Williams with the idea of the pre-game proposal about a week before. “He contacted me and asked if it would be alright if he could do this, and if I thought it was a good idea,” Williams remembered. “I went, ‘uh, what if she says no? But I went, ‘ok, yes sure, I’m here to support you’,” he added. “I was excited, it’s not very often, if ever, you get to be a part of something like this, so it was kind of fun to have a part to play in it,” said Raeside. Over the next week, the Athletics Department planned the surprise and informed those who needed to know, including the men’s basketball team. “It was pretty cool,” said second-year guard Grady Huskisson. “We where happy for Cass and excited for him. He had talked to us previously so we knew it was going to happen so it was funny seeing Mel’s reaction,” he added. Additionally, the game’s referees and VIU’s head coach were also informed. Mark then went shopping for a dress and shoes with her daughter Maya in Mark’s Mount Pleasant constituency, finding her dress at Dutchess and her shoes at Little Ms. Vintage. Then, less than a week later, they were married at New Brighton park – a place special to both of them since their childhoods. The happy couple is now not only getting congratulations from their close friends and family and other members of their lives, they’re also garnering the adoration of thousands of people who have seen a video of the event online. They’ve even received a painting of the event from someone. Basketball is a sport that often lives in lore. What happened between Kannemeyer and Mark however, transcends the sport and its greatest plays. 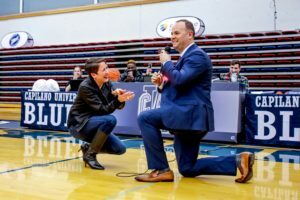 Their moment on the floor of CapU’s gym exhibited how the passion one gains for a game is nothing less than a learning experience that transfers into the facets of life that supersede sport. Kannemeyer and Mark came together through their shared passions but left that night sharing a future.